A Tradition of Comfort Food with Flair - original recipes, including gluten-free, nondairy, vegan and vegetarian as well as those for omnivores; classic comfort food prepared with care and the finest seasonal, sustainable and organic ingredients. Potato-Leek Soup, thick and creamy, is the classic winter soup of the British Isles. A lot of people in the US (like the grocery checker who asked me what they were) have never even had leeks. Probably one of the reasons is that any time you see them mentioned anywhere, such a fuss is made about how difficult they are to clean. Well, I'm here to tell you, that's just not true. Nobody is more concerned about cleaning their produce properly than I am, and I've discovered the easiest way to do it is to slice them up first and then wash them. Just trim off the green part and the root end. Slice the leek in half the long way. 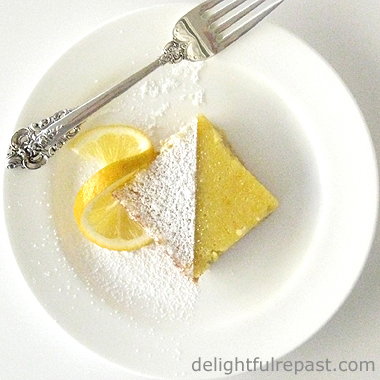 Cut each half in half the long way and slice thinly. Then put them in a salad spinner and add water, swirl them around, lift out the strainer basket, pour the dirty water out of the outer bowl; repeat. If the leeks were particularly dirty, repeat again. If you like a perfectly smooth, really thick and creamy soup, you can puree it with an immersion blender and use half and half or cream in place of some of the milk. But I like the little chunks I get with the potato masher. And I like to add the garnish at the last minute and watch the cheese melt into the steaming soup. 1 In 4-quart pan (I use my 5.5-quart Le Creuset French oven), saute the leek and celery in butter over low heat until soft and translucent, about 15 minutes. 2 Add broth and potatoes, bring to boil, reduce heat, and simmer until potatoes are soft, about 20 minutes. Remove from heat. 3 Using potato masher, coarsely mash potatoes. Put back over heat. Add milk and seasonings. Taste and adjust seasoning. Ladle into bowls and garnish each bowl just as it's served (so everyone can watch the cheese melt into the soup!). Jean, that looks just fabulous! And you're right - this winter weather, with temps to go way below zero tonight, calls for a hearty soup like that. I have found that the only chicken broth I can tolerate (except if I made my own, I suppose) is Pacific Organic, Free Range Chicken Broth. I now use it exclusively. I even use it in your beef stew recipe! I haven't found a beef broth that doesn't give me an adverse reaction. I LOVE potato leek soup. YUM! And I sure try to put the fun in dysfunctional - it is the only way to live. This just sounds wonderful! I love potato leek soup. I particularly like it in cold weather. Thanks for the tips on cleaning leeks. Judy, you use the exact same chicken broth I use! I love Pacific Organic! Hope your daughter can get that Pinning issue squared away for you. Sandie, thanks! And I like your attitude! Thanks, Sheila! Let me know how it works for you! That's a bowl of comfort and warmth, Jean. Gotta make some soup for the lunch today too. 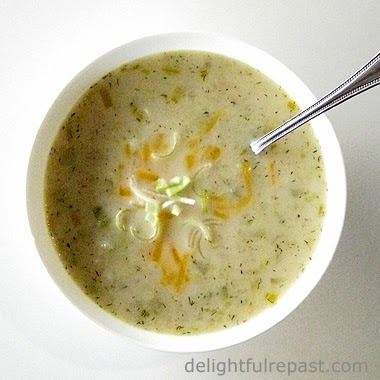 Potato leek soup is one of our absolute favorites!!! In the winter I try and make it at least once a month... and sometimes I'll even make some fried leeks to go on top as garnish!! YUM!!! Angie, thanks! I'll be making soup for lunch today, too. Mmm, fried leeks! That sounds so good, Jenn! A victory of prose over potato! Jeani 1, spud 0. As you may recall, I’ve pretty much abandoned starches, potatoes inclusive; but your elegant description actually makes my taste buds leak – I mean leek. I think it is the leeks, in fact, that put the briskness in your brew! A potato potion by itself wouldn’t do that to me. But I use leeks in Shrimp Sully White (a kind of creamed shrimp dish I make), and it’s for much the same reason. The shrimp and the sauce are rather bland, as are potatoes. And it sure do look pretty on a day with -35° chill factors here in Minnesota! Sully, thank you! And I'm glad to hear you're a fan of leeks! I was rather surprised by that. Your Shrimp Sully White sounds interesting. The name rather implies that you make another shrimp dish with sauce of another color? Thanks so much, Susie! Stay warm and cozy! That gives me something to look forward to! Karen, thank you sooooo much! I'm making it again today because we're having a lovely cold and rainy day (my favourite kind). This sounds like a great Winter warmer. If I close my eyes I can just imagine a bowl of this steaming broth in front of me. Just as an aside, Jean, if you ask for a Winter Warmer over here you will be given a dark, rich, malty flavoured beer with a touch of spice. Very nice. Just read your observation on leeks,Jean. "A lot of people in the US (like the grocery checker who asked me what they were) have never even had leeks." Let me tell you, leeks are great boiled, sliced with a creamy parlsey sauce drizzled over them. Also, if any of you have the privilege of attending a rugby game at Cardiff Arms Park in Cardiff, you will notice that the Welsh supporters wear them in their hats or wave them about above their heads. The leek is a Welsh National Symbol. The daffodil is another Welsh symbol by the way. I am obliged to promote leeks. My wife is Welsh!!! ha! ha! Thanks, Tony! Every time I see leeks I think of The Good Life episode where some bloke is coming through Surbiton pinching leeks from the Good's front garden. Yes, Greg, I love food lore too! I think the chilled version, Vichyssoise, was invented in New York by a French chef. And who knows where the hot version was first made. I think a lot of dishes probably sprang up in lots of places at the same time - as you put it, food evolves around cultures. Here you'll find original recipes that warm the body and the soul, recipes of the sort to become a family tradition in your family as well as mine. And I go outside the purview of food blogs with the occasional article about tea, wine and travel. Freelance writer, food blogger, blogger for hire, recipe developer, recipe tester, ghostwriter. Twitter @delightfulrepas (and, no, that is not a typo!). Email delightfulrepast at aol dot com. It supports this blog at no cost to you when you start your Amazon shopping through one of my links. Sugar - Toxin or Treat?